Hero Hill is a hill southeast of Cheydinhal. 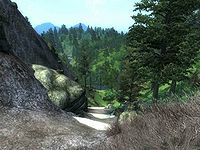 Although it is only a foothill of the Valus Mountains, it is a long steep climb to get here, facilitated by some stone steps near the top. The only feature of interest is a "Hollowed-Out Rock", used as a dead drop in the Dark Brotherhood quest Affairs of a Wizard. Esta página foi modificada pela última vez à(s) 01h17min de 24 de junho de 2013.